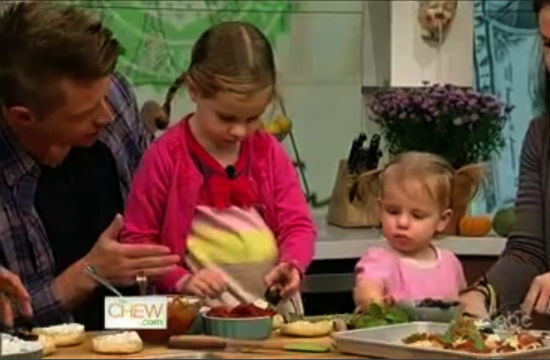 Today was One Dollar Wednesday on The Chew, which, unlike Boozeday Tuesday on The Today Show, is an actually useful theme for viewers. All episode long, the hosts were cooking meals for under $1 per serving, and Clinton Kelly even created a tablescape for under a dollar. Watch your back, Sandra Lee. But, of course, our favorite segment was when guest (and long-time Top Chef pal of Carla Hall’s), Richard Blais stopped by with the whole Blais clan to show off English Muffin Pizzas. His four-year-old Riley (whom you may remember as an Elmo lover), and 19-month-old Embry were both on hand with mom Jazmin to construct mini pizzas with their own topping combos. Riley is a machine, you guys. She cranked out at least 15 of them in the segment. Plus she’s chatty, well-behaved, and knows when to turn on the charm — she gave Daddy a big hug at just the right “aww” moment. Richard confirmed that she’s obsessed with being on camera after taping Life After Top Chef for two months, and now asks where the cameras are when she comes home from school and they aren’t around. …Is this how Snookis are born? Check out the two (have we mentioned they’re adorable?) clips below.